Hanging out at mom’s office in midtown Manhattan after a harrowing experience. Lily’s fearlessness is something I always intuitively recognized, but it came to the forefront a few weeks back when I was packing up the taxi to take her to my office for the day. Her hand slipped from my grip for a split second and she darted out into the middle of Amsterdam Avenue as the stoplight was just about to turn green. I was able to grab her before anything bad happened but I was completely rattled. She, on the other hand, was not. Maybe fearless isn’t the right term – it’s more of a lack of understanding of consequences when engaging in certain activities. Lily is learning to read and write and do math and all the other things that a typical 7-year old would be learning in school. She’s really smart. But there’s this missing filter that I find to be quite baffling. When I’m baffled by something, I turn to research, which includes reaching out to other Rett parents to hear their experiences. Turns out that this missing fear filter is all too common for ambulatory Rett girls. I received over 40 comments on the Rett family support group from parents telling me stories of their ambulatory kiddos darting off in the middle of busy airports or fleeing playgrounds or even worse. Fearlessness isn’t necessarily something that would spring to mind when thinking of a child with Rett Syndrome, is it? But from what I’ve experienced – and heard from other parents – this is a Rett symptom that is VERY REAL. I’ve not read about it in any literature or in any research papers. There are so many other crazy symptoms to keep an eye out for, this is one that’s just been overlooked. So how am I managing this? Well, other than taking a healthy dose of Xanax to calm my nerves, I’ve spoken to school about my concerns and they are adding goals to her IEP about helping her better understand dangerous activities and why she should not be engaging in them. Also, we’ve found an outlet for her fearlessness: rock climbing! 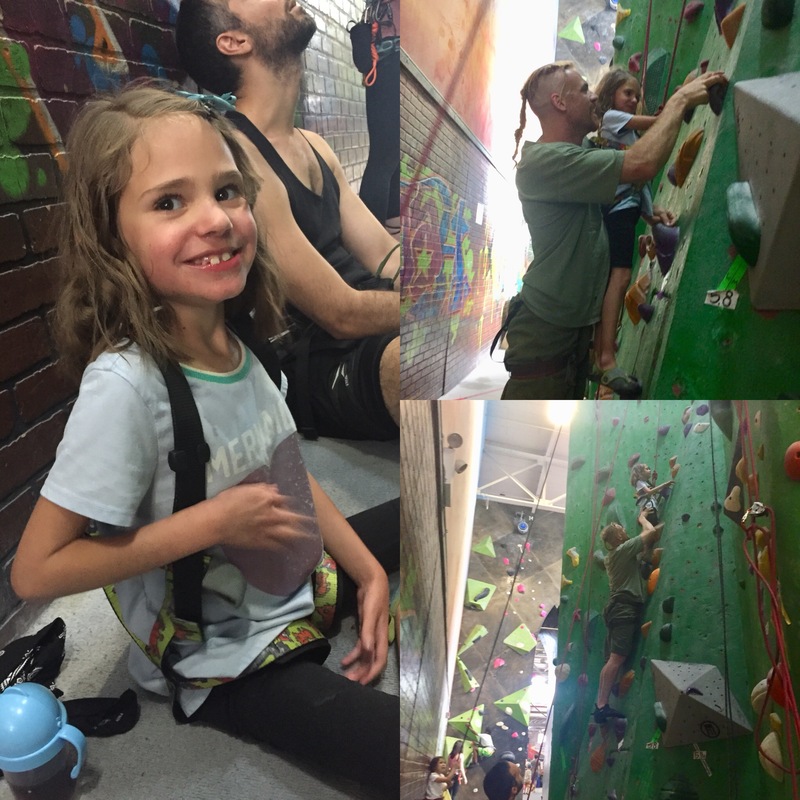 For the past two weeks Lily’s dad has taken her to Brooklyn Boulders, an indoor rock climbing gym, where she scales the walls. Literally! Yesterday this kid rang the bell twice, which in rock-climbing lingo means she climbed to the tippy top of the wall. On one hand, I’m eternally grateful that I have a child with Rett Syndrome who rock climbs fearlessly. I know too many Rett moms who would be overjoyed with seeing their sweetie take a few steps. So I don’t take my child’s abilities lightly. However, managing her lack of a fear filter – especially as she gets older – is something that her nannies, therapists, teachers, relatives, friends and parents will ALL have to stay on top of. So, I thank you all in advance for helping us navigate this dangerous and little known Rett symptom. Rock climbing with her dad in Brooklyn! 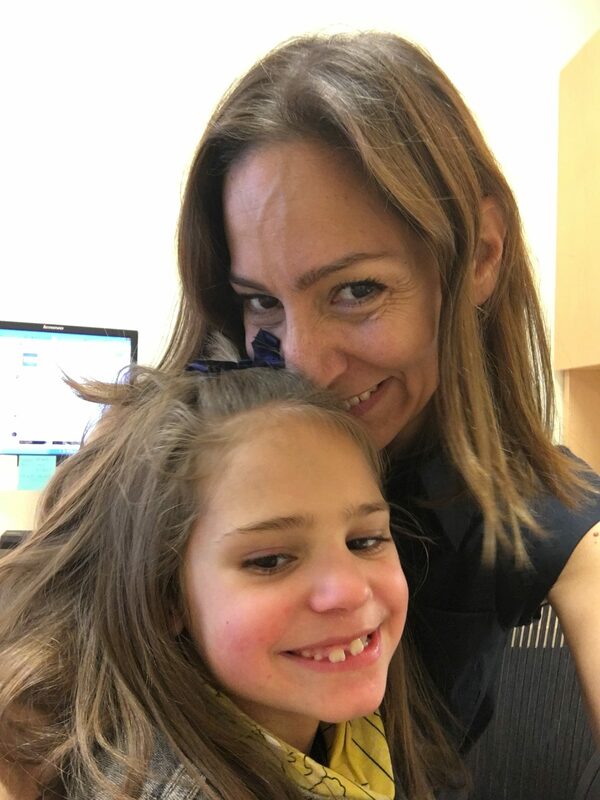 This entry was posted in Awareness raising, Education, Speranza/Hope and tagged Accessibility, Ambulatory, Brooklyn Boulders, IEP, Rett Syndrome, Rock Climbing. Bookmark the permalink. ← And… we’re moving again! Rock climbing with her Dad is so special. Glad she has a fearlessness outlet. I so commend you, my daughter, for bringing this little known symptom to everyone’s attention. I know I will be more diligent when I am with my beautiful granddaughter. Wow Chrissy….You got this……We miss you. Wow Lily!!! I’m proud of your grit, but go easy on your Mom!! !